A bed is a piece of furniture used as a place to sleep or relax. Most modern beds consist of a soft mattress on a bed frame, with the mattress resting either on a solid base, often wooden slats, or a sprung base. Many beds include a box spring inner-sprung base, a large mattress-sized box containing wood and springs that provide additional support and suspension for the mattress. Beds are available in many sizes, ranging from infant-sized bassinets and cribs, small beds for a single child or adult, to large queen and king-size beds designed for two adults. While most beds are single mattresses on a fixed frame, there are other varieties, such as the murphy bed, which folds into a wall, the sofa bed, which folds out of a sofa, and the bunk bed, which provides two mattresses on two tiers. Temporary beds include the inflatable air mattress and the folding camp cot. Some beds contain neither a padded mattress nor a bed frame, such as the hammock. Beds may have a headboard for resting against, with others also having side rails and footboards (or “footers”). “Headboard only” beds may incorporate a “dust ruffle”, “bed skirt”, or “valance sheet” to hide the bed frame. To support the head, a pillow made of a soft, padded material is usually placed on the top of the mattress. Some form of covering blanket is often used to insulate the sleeper, often bed sheets, a quilt, or a duvet, collectively referred to as bedding. Bedding is the removable non-furniture portion of a bed, which enables these components to be washed or aired out. 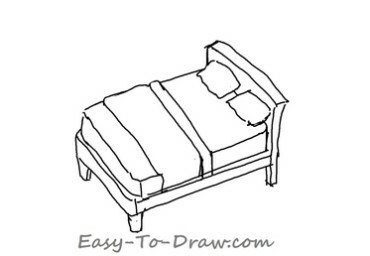 Here are the steps to draw Cartoon Bed. Enjoy! 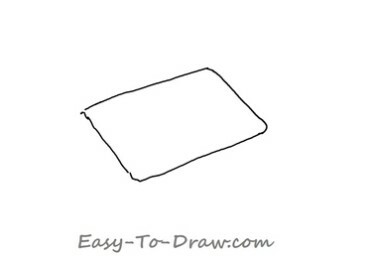 Step 1: Draw a parallelogram as the mattress. 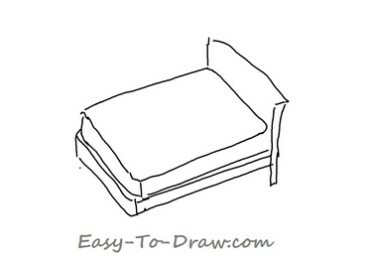 Step 2: Draw the headboard, rails and foot-boards. 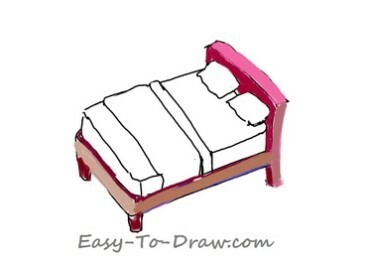 Step 3: Draw 3 feet at the bottom of the bed with 1 quilt and 2 pillows on the bed. 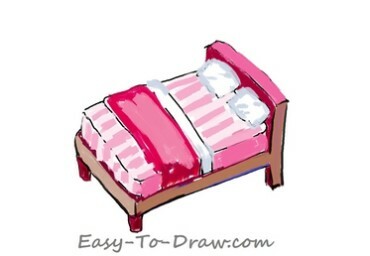 Step 4: Color the headboard pink and the rails brown. Step 5: Color the quilt rose color and the sheet in pink stripes. Step 6: Color the pillows and the top of the quilt with some light grey color. Cartoon Bed Video Drawing Tutorial for kids!